With those stunning, only-in-Erie sundowns serving as its remarkably beautiful backdrop, the annual UPMC Sunset Music Series kicks off its 2017 season this month and continues on Wednesday evenings through July. First up, on June 14, is the longstanding and seriously legit locally-based Allman Brothers Band tribute Blue Sky, being joined by local (and also seriously legit) blues-rockers The Vehicle. The schedule was made before the recent death of Allman Brothers founding member Gregg Allman, but that night's performance is sure to serve as a more-than-apt send-off to the late legend. Next up, on June 20, the series welcomes back Albany-based rock-'n-soul duo Sirsy. That Rust Belt-hewn girl/guy duo — being joined that night by opener The Dock Boys — has become rather familiar with (and well-heard in) our fair city, having played repeat shows at various Erie locales and events like the UPMC series in recent years. The series continues with The Groove and openers The O'Needers on June 28, Stilleto and openers Guru on July 5, Key West Express and openers Brenna Bone and Seann Clark on July 12, and, to cap the 2017 series off, Tennessee Back Porch with openers Jackson Station on July 19. 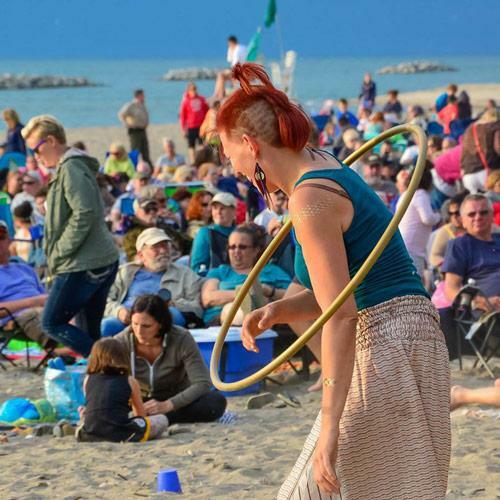 Add in all the other fun happening at every show – hula hoop workshops, food, raffles, and other cool stuff – and we have one helluva sweet little summer getaway. Right in our own backyard. And in the middle of the week.